Tom Collins scored a hat-trick in his side's bonus-point victory over Worcester. Northampton came from behind to secure a bonus-point win against Worcester. Warriors went ahead through the boot of Tom Heathcote before Val Rapava Ruskin bulldozed over to extend their lead. Northampton replied with tries from Harry Mallinder and Tom Collins but Wynand Olivier's converted try gave Worcester the advantage at the break. But Collins and Lee Dickson scored either side of a Heathcote penalty, before Collins completed his hat-trick and Saints' Ken Pisi added a sixth try. Worcester, who were looking to do the double over Saints having beaten them 13-12 on the opening weekend, took the lead against the run of play as Heathcote punished Northampton from the kicking tee. On a blustery afternoon at Franklin's Gardens, Stephen Myler then twice turned down the chance to kick at goal before Georgia prop Rapava Ruskin finished off a routine training ground move to extend Warriors' lead. But Saints replied almost immediately as Pisi showed terrific pace before offloading for Mallinder to score and they grabbed a second in quick succession when Ben Foden found Collins out on the wing. Against the run of play, Worcester led at half-time through a great line break from Olivier, but they could not maintain that level of performance. Saints scored within two minutes of the restart as Luther Burrell's sublime pass crated a second try for 21-year-old Collins, only playing because of Welshman George North being on international duty and an injury to Jamie Elliott. Heathcote's penalty put Worcester back in front momentarily but, in what was a tight affair until the latter stages, Lee Dickson was awarded a try following a good Saints drive, Myler adding the extras to push the lead out to six points. Northampton then wrapped up victory against a tiring Warriors defence as Jamie Gibson showed a turn of pace to put in Collins for his hat-trick before Pisi's converted try completed the scoring. It was a second five-point win at home in a row for Northampton, who are finally looking like the side that won the Premiership in 2014. "It is really tight at the top. We have won three of our last four games. It is not easy around this period with the internationals, players being away and coming back. "We had Luther Burrell and Kieran Brookes away, while Courtney Lawes was picked then he goes away. It's not an easy time to get the lads organised. "Tom Collins is a cracking finisher. He has good feet. He is still young and still has parts of his game to work on, but he is showing a lot of promise. It is nice to have youngsters from the area coming through." "We contributed to their field position as much as their own pressure. We can't have that error count and expect to play against the best sides. It is frustrating because it is some of the basics. Not-straight throws, not getting our job right, and defensive errors mean you're always going to find yourself in that bottom corner. "We dropped the kick-off after half-time, and they scored from that. That has happened two or three times this year - other than telling people to catch the ball I'm not sure what else we can do. "There were a lot of positives in the first half about the way we were playing, but you have to underpin it with some sounds foundations and it wasn't good enough." 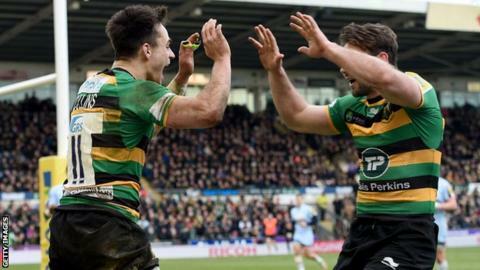 Northampton Saints: Foden; K Pisi, Burrell, Mallinder, Collins; Myler, Dickson (capt); Waller, Haywood, Brookes, Craig, Matfield, Gibson, Wood, Harrison. Replacements: G Pisi for Mallinder (50), E Waller for A Waller (64), Hanrahan for Myler (72), Kessell for L Dickson (72), Marshall for Haywood (73), Denman for Brookes (73). Worcester Warriors: Pennell; Heem, Olivier, Mills, Vuna; Heathcote, Hougaard; Rapava Ruskin, Bregvadze, Schonert, O'Callaghan, Barry, Potgieter, Kirwan, van Velze (capt). Replacements: Johnston for Schonert (58), Dowson for Kirwan (58), Leleimalefaga for Rapava Ruskin (58), Symons for Mills (66), Lamb for Heathcote (66), Annett for Bregvadze (66).